Manson = Lewis Carroll? YAY! Shock rock singer Marilyn Manson plans to play author Lewis Carroll in a movie about the Alice in Wonderland author, Screen International has reported. Manson hopes to direct the self-penned "arthouse horror" movie Phantasmagoria - The Visions Of Lewis Carroll. He will attend Berlin's European Film Market to help fund the $4.2m (£2.3m) movie, the industry website said. "What people expect from Manson, they're going to get here," said producer Alain de la Mata. 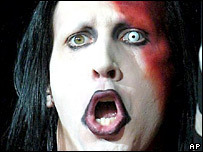 Manson, real name Brian Warner, has had transatlantic hits including The Dope Show and Disposable Teens and has directed his own music videos. The 36-year-old has spent the past year working on costumes and make-up for the movie. "He didn't want to wait for Cannes to do this, he's ready now," said de la Mata, who hopes to complete filming this autumn. The European Film Market is part of the 10-day Berlin Film Festival, or Berlinale, which starts on 9 February.